Now we continue with the changes in the shapes of tantô and hira-zukuri ko-wakizashi, that means blades that come under the category of a dagger and not of a short sword like the later developed and noticeably longer shinogi-zukuri wakizashi. Tantô from before the early Kamakura period are exceptionally rare, so rare that they can be ruled out again for our kantei descriptions. This changes with entering the Kamakura period, although early Kamakura-period tantô are still very rare. Thus we are facing the same problem as with tachi, that is to say the lack of references which greatly limits our insight in shorter blades made at that time. Those few extant early Kamakura tantô are in hira-zukuri, show a little uchizori, have a rather full fukura, and measure mostly less than 24 cm. But it must be noted that there are also noticeably longer early Kamakura-period tantô extant. For example the Kyôto smith Awataguchi Hisakuni from whom we know a tantô with a nagasa of 29.1 cm and one with a nagasa of just 20.1 cm. 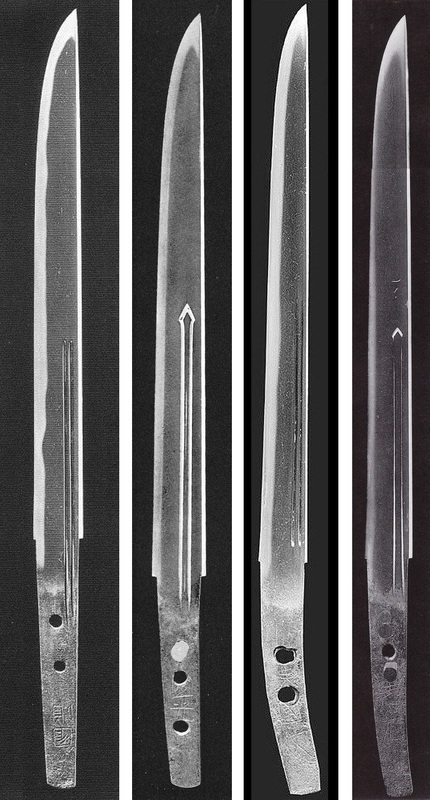 Also it is safe to assume that also noticeable longer daggers were made throughout all these earlu times but which just did not survive as being merely weapons and utilitarian objects. Representative schools and smiths for early Kamakura period tantô are: The Awataguchi (粟田口) school (Kunitomo [国友], Hisakuni [久国]). 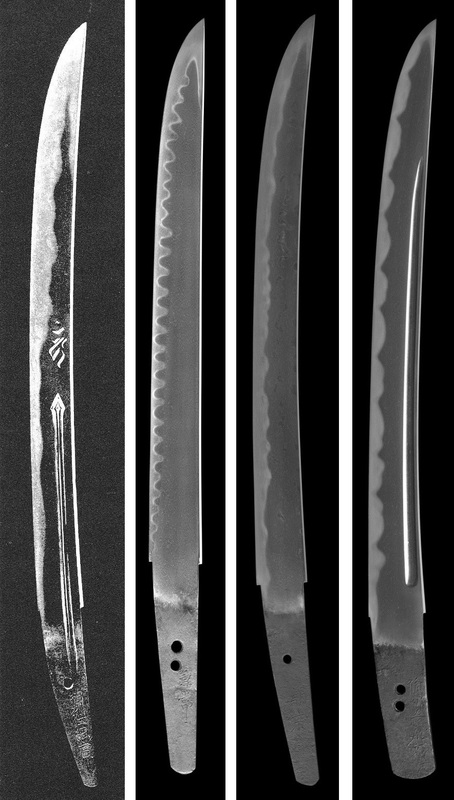 With the mid-Kamakura period, tantô level off at a standard length (jôsun, 常寸) of 25~26 cm, although of course also some shorter and longer blades were made which measure around 20 or 29 cm respectively. They are in hira-zukuri, have uchizori, and mihaba, fukura, and kasane appear at the jôsun interpretations in a highly harmonious manner. Because of this, the mid-Kamakura period is regarded as the time of bringing forth the most aesthetical tantô-sugata. But also some noticeably tapering tantô were made in the mid-Kamakura period and so classifying Kamakura-era tantô can be as difficult as classifying Kamakura-era tachi. Representative schools and smiths for mid-Kamakura period tantô are: The Awataguchi (粟田口) school (Norikuni [則国], Kuniyoshi [国吉], Yoshimitsu [吉光]), Rai Kunitoshi (来国俊), the Shintôgo (新藤五) school (Kunimitsu [国光], Kunihiro [国弘]). With the late Kamakura period it is as difficult as with the mid-Kamakura period, that means tantô maintain on the one hand the classic shapes, but grow on the other hand quite large. Accordingly there are tantô with a jôsun-nagasa, uchizori, and a very harmonious ratio of mihaba to nagasa, kasane, and fukura. Representative schools and smiths for these classic late Kamakura-period tantô are: The Rai (来) school (Kunimitsu [国光], Kunitsugu [国次]), Osafune Kagemitsu (長船景光), the Masamune (正宗) school (Yukimitsu [行光], Masamune [正宗]), Norishige (則重). At the same time tantô with a nagasa of 27~32 cm, muzori or even a little sori, and a somewhat wider mihaba are seen. These were often made by Rai Kunimitsu (来国光), Rai Kunitsugu (来国次), the Hoshô (保昌) school, and Sadamune (貞宗) for example. And hira-zukuri tantô with a strikingly wide mihaba for their nagasa, the so-called Hôchô-style tantô (包丁, kitchen-knife tantô), were made among others by Masamune. Please note that Hôchô-style tantô were already made in the previous mid-Kamakura period, for example by Awataguchi Yoshimitsu. Also relative many kanmuri-otoshi or unokubi-zukuri tantô with a thin kasane and muzori were made in the late Kamakura period, mainly by the Taima (当麻) school, Ryôkai (了戒), Ryôsai (良西), or Shikkake Norinaga (尻懸則長). And towards the very end of the Kamakura period certain smiths like Sadamune (貞宗), Takagi Sadamune (高木貞宗), Osafune Kagemitsu (長船景光), or Kanro Toshinaga (甘露俊長) started to make tantô in katakiriba-zukuri which can come without sori or with a very shallow sori. 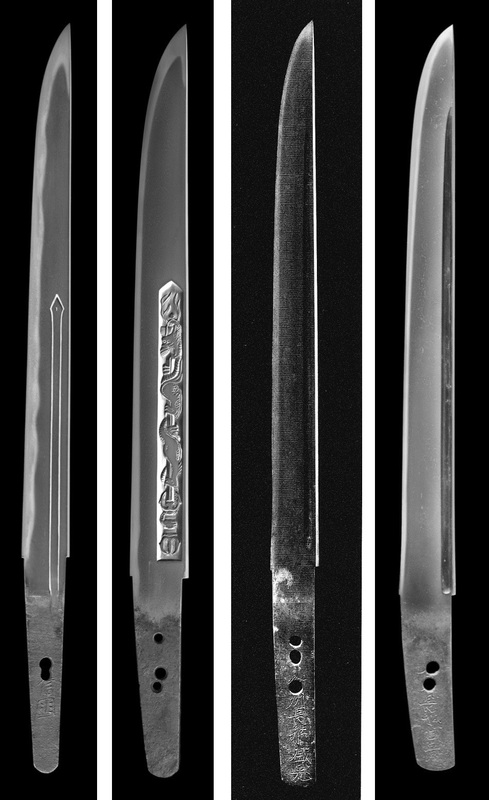 When it comes to tantô, the mid-Nanbokuchô period brought the same trend towards oversized blades as it was the case for tachi. Please note that according to our present-day nomenclature, all “dagger” blades that measure over 1 shaku in nagasa are classified as wakizashi. Also the term sunnobi-tantô (寸延短刀) is in use to refer to refer to tantô which measure just a little bit more than 1 shaku. For oversized mid-Nanbokuchô period also the term Enbun-Jôji-sugata is in use which has the following features: Long nagasa of 30~40 cm, wider mihaba, full fukura, thin kasane, noticeable sakizori. Representative schools and smiths for mid-Nanbokuchô tantô in Enbun-Jôji-sugata are: For Kyô-mono the Hasebe (長谷部) school (Kunishige [国重], Kuninobu [国信]) and the Nobukuni (信国) masters of that time; the next generation of Sôshû smiths (Hiromitsu [広光], Akihiro [秋広]); the Kanemitsu (兼光) school (Kanemitsu [兼光], Tomomitsu [倫光], Yoshimitsu [義光]); the Chû-Aoe (中青江) school (Tsugunao [次直], Tsuguyoshi [次吉]); Kinjû (金重), the Naoe-Shizu (直江志津) school (Kanetomo [兼友], Kanetsugu [兼次]). 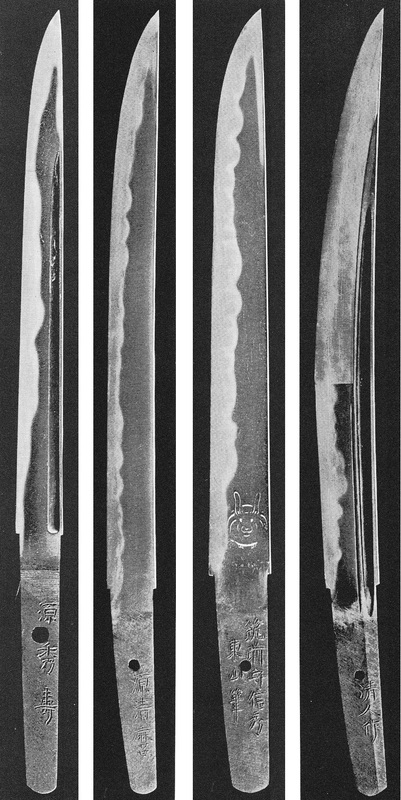 Parallel to the trend to extra large tantô or hira-zukuri ko-wakizashi, there were certain mid-Nanbokuchô smiths who remained faithful to more classic tantô shapes, for example Shizu Saburô Kaneuji (志津三郎兼氏), Osafune Chôgi (長義), Osafune Tomomitsu (倫光), or Ô-Sa (大左). Their tantô have a normal to just a little elongated nagasa, muzori or just a hint of a sori, and a moderate mihaba. Tantô and hira-zukuri ko-wakizashi did not stop growing towards the end of the Nanbokuchô and antering the Muromachi period. That means, the mid-Nanbokuchô period already brought rather large Enbun-Jôji-style dagger blades but with entering Muromachi times, the classical tantô decreases in number and the ko-wakizashi occasionally even reaches wakizashi lenghts. The sori is due to the length more noticeable and appears as sakizori but we observe that the wide mihaba of the previous period gradually disappears. 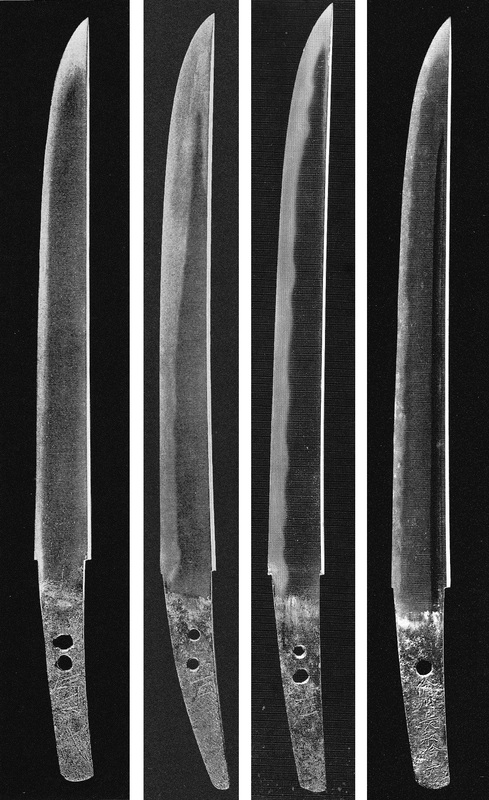 Representative schools and smiths for such long hira-zukuri ko-wakizashi are: The Ôei-Bizen (応永備前) school (Morimitsu [盛光], Yasumitsu [康光]) or the 3rd generation Nobukuni (信国). But we must bear in mind that most of these smiths made at the same time also still classical tantô with a nagasa of slightly less than 30 cm and muzori. Also kanmuri-otoshi-zukuri tantô were continuously made in the early Muromachi period and representative for such blades and for that time are: Tegai Kanezane (手掻包真) and the Niô (二王) school (Kiyonaga [清永], Kiyokage [清景]). Anyway, we learn that tantô generally decrease in number with entering the Muromachi period. From the mid to the late Muromachi period we see how the wakizashi in general and the shinogi-zukuri wakizashi in particular gradually replaces the hira-zukuri ko-wakizashi but blades of the latter category were still made. They show a wide mihaba, no longer a thin but an appropriate kasane for the length, a full fukura, and a deep sakizori. Representative schools and smiths for hira-zukuri ko-wakizashi of that kind are: The Sue-Seki (末関) school (Kanefusa [兼房], Kanehisa [兼久], Kanemura [兼村]), Sengo Muramasa (千子村正), Tsunahiro (綱広), or Shimada Yoshisuke (島田義助). In late Muromachi times, classic Kamakura-period tantô with a short nagasa of about 23~26 cm and with uchizori experienced a revival. 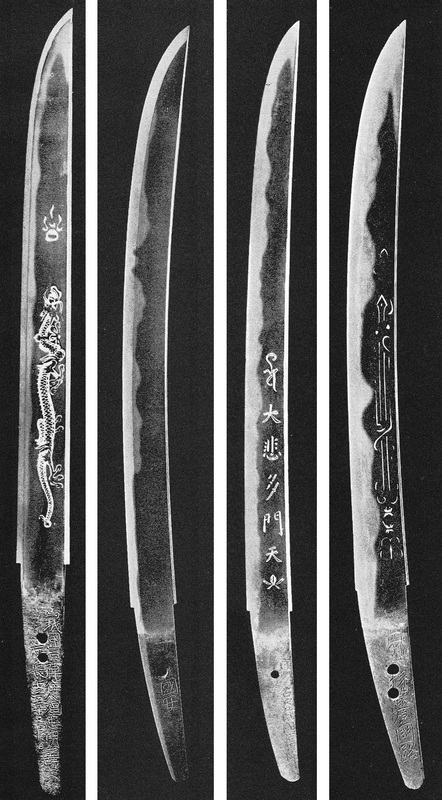 Such blades were often made by the Sue-Seki (末関) school (Kanesada [兼定], Kanetsune [兼常]), Osafune Sukesada (長船祐定), Shimada Yoshisuke (島田義助), or Sue-Tegai Kanekiyo (末手掻包清). Parallel to that a new tantô styles appears, the moroha-zukuri tantô, that has mostly a rather short nagasa of about 20~23 cm and a shallow sori and that was often made by the Sue-Bizen (末備前), the Sue-Seki (末関), and the Sue-Mihara (末三原) school. The same way as the Enbun-Jôji-sugata was revived at that time for tachi, it was also revived for tantô. That means we see again longer hira-zukuri ko-wakizashi or sunnobi-tantô with a wide mihaba but this time with a sakizori (a remnant of the previous late Muromachi period), a fuller fukura, and a thicker kasane. 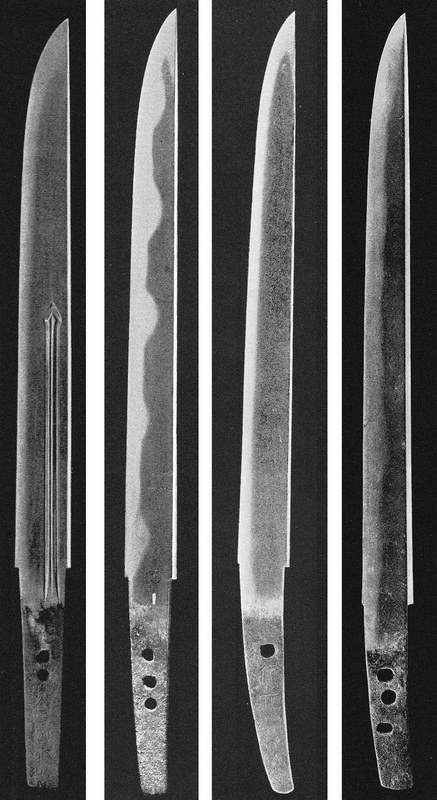 Please note that most of these Momoyama to early Edo period blades are, due to their nagasa, today classified as wakizashi. 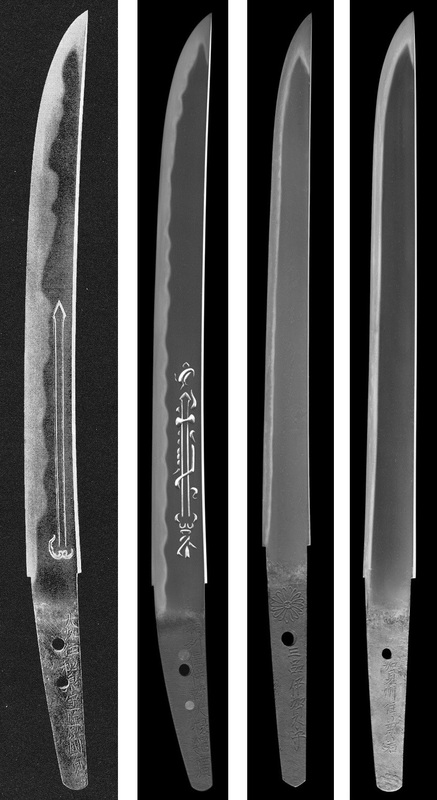 But they were intended as copies of mid-Nanbokuchô blades where the classic wakizashi was yet not introduced. Representative schools and smiths for a Momoyama period sugata or a Keichô-shintô-sugata are: Umetada Myôju (埋忠明寿); the Horikawa (堀川) school (Kunihiro [国弘], Kunimichi [国路], Kuniyasu [国安]); the Mishina (三品) school (Etchû no Kami Masatoshi [越中守正俊], Iga no Kami Kinmichi [伊賀守金道], Tanba no Kami Yoshimichi [丹波守吉道]); Echizen Yasutsugu (越前康継), Higo no Daijô Sadakuni (肥後大掾貞国), Hankei (繁慶), Nanki Shigekuni (南紀重国), Hizen Tadayoshi (忠吉), Kashû Kanewaka (加州兼若). Parallel to that, some of the above mentioned smiths like Umetada Myôju, Horikawa Kunihiro, Horikawa Kuniyasu, Hizen Tadayoshi, Echizen Yasutsugu, or Higo no Daijô Sadakuni made also tantô in katakiriba-zukuri with a wide mihaba, a nagasa of about 30 cm, and either with a little sori or with uchizori. The production of tantô decreases significantly from the early Edo period onwards and those found are often copies of old kotô pieces, for example of the great early Sôshû masters like Masamune or Sadamune. And this means as mentioned in the last section that they show a longer nagasa and are therefore today classified as wakizashi. Occasionally tantô can be found from the following smiths: Kotetsu (虎徹), Mino no Kami Masatsune (美濃守政常), Harima no Kami Tadakuni (播磨守忠国), certain Hizen smiths, Ise no Daijô Tsunahiro (伊勢大掾綱広), and the later generations Yasutsugu (康継). 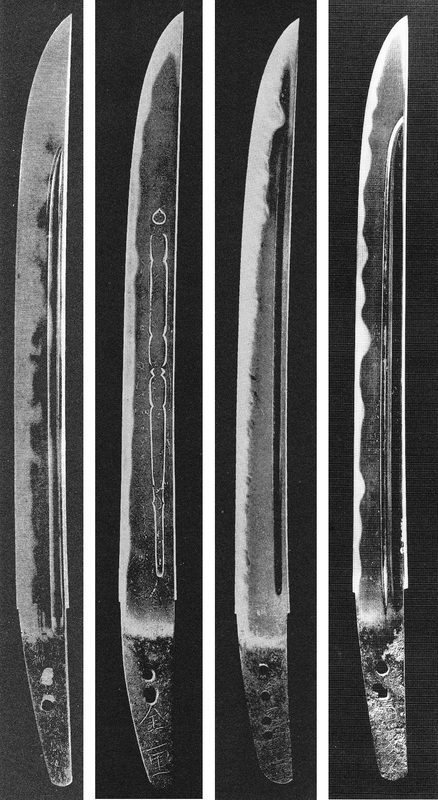 The same Nanbokuchô revival as for long swords is seen at that time at tantô, i.e. hira-zukuri ko-wakizashi with a nagasa of 39~43 cm and a wide mihaba came again in fashion, although this time with a thicker kasane and with sakizori what distinguishes them from the “originals.” Representative smiths for these Enbun-Jôji revival blades are: Taikei Naotane (大慶直胤), Kiyomaro (清麿), Saitô Kiyondo (斎藤清人), Sa Yukihide (左行秀), Kurihara Nobuhide (栗原信秀), Hôki no Kami Masayoshi (伯耆守正幸), Oku Motohira (奥元平). 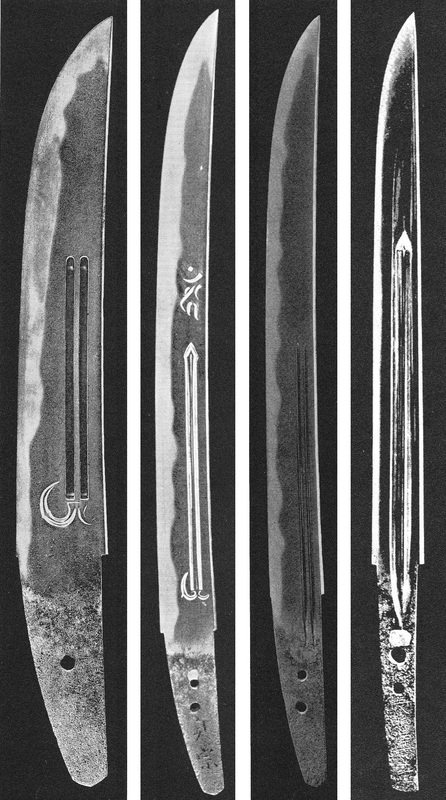 Many different dagger forms were taken up again in late shinshintô times, for example stout and thick yoroidôshi, ko-wakizashi in shôbu-zukuri, or osoraku-zukuri, kissaki-moroha-zukuri, and kanmuri-otoshi-zukuri blades. But we must not forget that still classic Kamakura-style tantô were made towards the end of the Edo period although with an important feature which most of the shinshintô-era tantô have in common, that is to say the somewhat thicker kasane. Thank you again, I have a tanto which is shinogi-zukuri, sori 5mm toniizori, , iorimune, mune 5.28 mm, blade length 270mm, mihaba 22mm, sakihaba 18mm, boshi 27mm, hada not sure, tang 85mm ha agari kurijiri. There are no tantos in this Sugata #7 of shinogi-zukuri type I AM LOST can you help please? PS please excuse spelling mistakes. Sorry, I have never seen any real shinogi zukuri tanto in 40 years of collecting. The ones I have seen were either modern replica or katana/wakizashi drastically shortened. Shinogi zukuri tanto are urban legend. It is as Jean said, i.e. chances are 99.9% that it is either a drastically shortened longer blade or a quite modern piece (20th century). But to go sure, please send me some pictures to “markus.sesko@gmail.com” so that I am able to confirm Jean and my suspicion. Thanks. Hi Markus I have emailed some pictures I look forward to hear what you and Jean think. I saw them a few minutes ago. IMO, It is a shortened wakizashi, the nakago has been re-shaped (remade -looks fairly new) if you look carefully the hamon enters the nakago and the angle of the tsuka which caves in at the level of the hamachi is explicit. Thank you Jean can you tell anything about the original age of the blade or original site of manufacture (from the hamon) I have looked more closley at the hada and it is fine straight lines? Do you mean the nakago has been recently reformed ( any gestemates how long ago)? I’ll say Shinto. Concerning nakago, may have been reformed in Shinshinto or gendai times. Look how fresh it looks unless it has been cleaned. Concerning the boshi of your other sword, picture is blurry, not easy to see it. It does not match any known/classical boshi. Could be ichimai but has to be seen in hand. Thank you Jean I will try to get some better pictures to you of the BOSHI. Fantastic information and your attention to help other is great. I am searching over you info but am a bit confused because the blades that you have pictured under the period are of a different time frame. I am trying to positively associate a tanto that I recently aquired. I know the year is 1577 but the maker is being a challenge.